A flight outside controlled airspace before proceeding into IFR conditions in controlled airspace. A visual flight rules (VFR) flight expecting IFR weather conditions en route in controlled airspace. 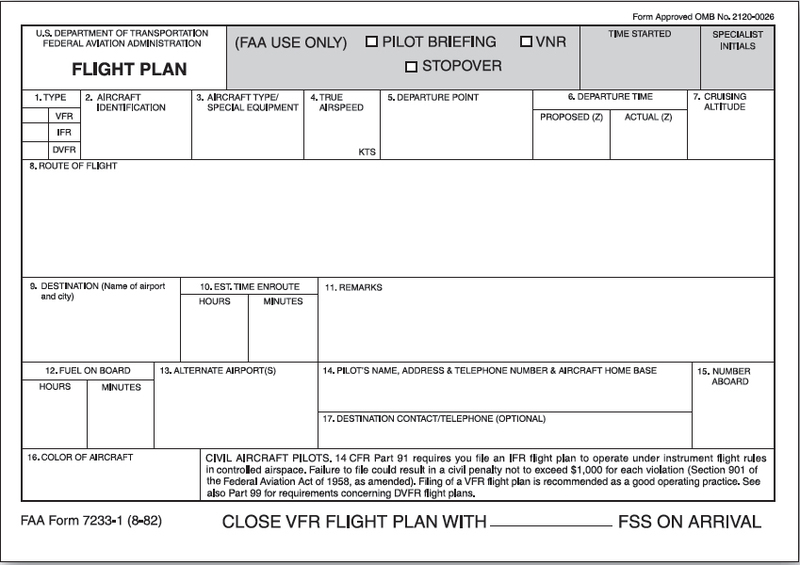 In either of these situations, the flight plan may be filed with the nearest FSS or directly with the ARTCC. A pilot who files with the FSS submits the information normally entered during preflight filing, except for “point of departure,” together with present position and altitude. FSS then relays this information to the ARTCC. The ARTCC then clears the pilot from present position or from a specified navigation fix. A pilot who files directly with the ARTCC reports present position and altitude, and submits only the flight plan information normally relayed from the FSS to the ARTCC. Be aware that traffic saturation frequently prevents ARTCC personnel from accepting flight plans by radio. In such cases, a pilot is advised to contact the nearest FSS to file the flight plan. An IFR flight plan may be cancelled any time a pilot is operating in VFR conditions outside Class A airspace by stating “cancel my IFR flight plan” to the controller or air-toground station. After cancelling an IFR flight plan, the pilot should change to the appropriate air-to-ground frequency, transponder code as directed, and VFR altitude/flight level. ATC separation and information services (including radar services, where applicable) are discontinued when an IFR flight plan is cancelled. If VFR radar advisory service is desired, a pilot must specifically request it. Be aware that other procedures may apply when cancelling an IFR flight plan within areas such as Class C or Class B airspace. When operating on an IFR flight plan to an airport with an operating control tower, a flight plan is cancelled automatically upon landing. If operating on an IFR flight plan to an airport without an operating control tower, the pilot is responsible for cancelling the flight plan. This can be done by telephone after landing if there is no operating FSS or other means of direct communications with ATC. When there is no FSS or air-to-ground communications are not possible below a certain altitude, a pilot may cancel an IFR flight plan while still airborne and able to communicate with ATC by radio. If using this procedure, be certain the remainder of the flight can be conducted under VFR. It is essential that IFR flight plans be cancelled expeditiously. This allows other IFR traffic to utilize the airspace.